The protein view page provides a table view of crosslinks or looplinks at the protein level. Each row in the table corresponds to a unique crosslink ( specific position in protein A linked to a specific position in protein B) or a unique looplink (specific pair of positions in a protein). The data may be filtered according to confidence, taxonomy, or individually by protein. 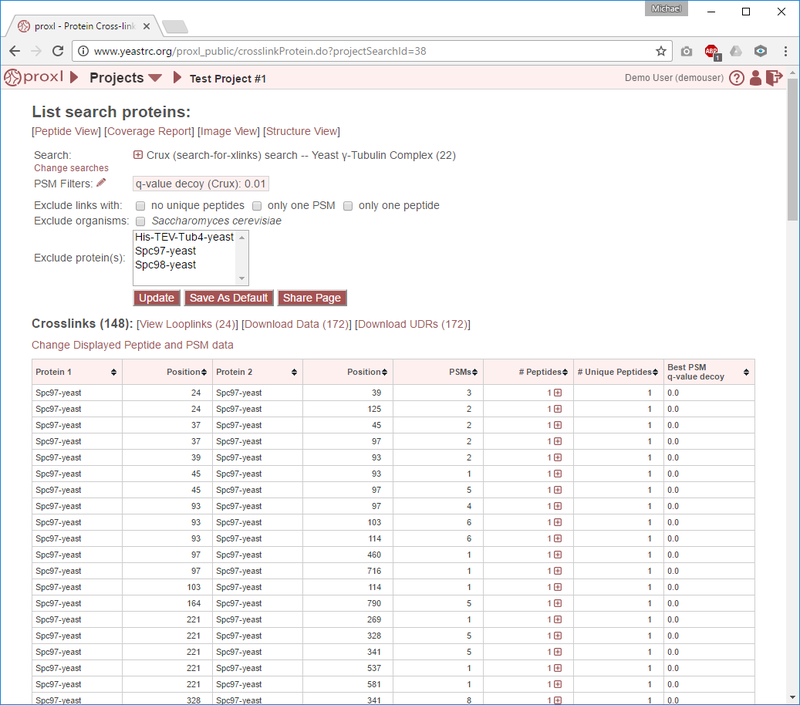 For the view page seen when merging multiple searches, see Merged Protein View Page. Note: If any identified peptides map to multiple proteins, those proteins are listed here as separate rows. For example if peptide 1 is linked to peptide 2, and peptide 1 maps to protein A and peptide 2 maps to proteins B and C, rows will be present for A-B and A-C. This may dramatically increase the number of reported crosslinks if your protein database is redundant in terms of homologous proteins or proteoforms or if small peptides are mapping to many proteins. The filtering options described below are meant to help eliminate this redundancy in reported proteins. Project owners may click “Save as Default” to save the current URL as the default view of the “Protein View” for this search. This default view will be populated with the same options as when the button is clicked. This is a convenient way to share data with collaborators or the public that does not require that they manipulate the image viewer to see the data. By default, the table shows crosslinks. To switch to looplinks, click the [View Looplinks] link at the top of the table. To view crosslinks again, click the [View Crosslinks] link that appears at the top of the table. All crosslinks and looplinks that meet the current filtering criteria may be downloaded as tab-delimited text by cliking the [Download Data (#)] link above the table. # indicates the number of rows in the table. UDR stands for “unique distance restraint”, which takes its name from 3D modelling terminology. A UDR, in proxl, is any specific position in a protein linked to a specific position in another protein, whether it is a crosslink or a looplink. The [Download UDRs (#)] link downloads a non-redundant tab-delimited text table of these UDRs consolidated from the crosslinks and looplinks. The # is the number of UDRs. The name of the search (and internal search ID reference number) from which these data were obtained is shown first. The red [+] icon may be clicked to reveal more information about the search, including the path the data were imported from, the linker that was used, the upload date, and the FASTA file that was searched. The data presented may be filtered according to the following criteria. Note: Only crosslinks or looplinks that meet ALL the filter criteria are shown. Some search algorithms, such as Percolator, provide statistics at the peptide level that may be used for filtering. If applicable, peptide-level filtering options may be set here. Only results which have at least one peptide that meets all of the selected critiera will be listed. Any links containing a protein that maps to any of the checked organisms will be excluded. The list of organisms presented was gathered by the proteins found in the search. Useful for filtering out groups of contaminant proteins. Any links containing a any of the selected proteins will be excluded. Multiple proteins may be selected or unselected using control-click (command-click on the mac) or shift-click. Useful for filtering out individual contaminant proteins. Project owners may save the current filter parameters as the default view of the data on this page by clicking this button. 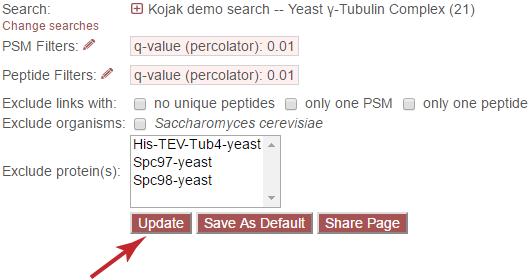 This default view will be shown when users follow links to the “Protein View” for this search. Above the table is the text “Crosslinks (#)” or “Looplinks (#)”. # is the number of rows in the table. The [View Looplinks (#)] links will change to viewing looplinks, where # is the number of looplinks that will be shown. The [Download Data (#)] link downloads the data as tab delimited text (see Download UDRs) and [Download UDRs (#)] downloads the UDRs as tab delimited text (see Download Data). This is the crosslinked position in the respective proteins, where the first residue is counted as position 1. In looplinked proteins, these are the positions in the protein that are linked. The total number of PSMs (peptide spectrum matches) meeting the cutoff that identified either crosslinked (crosslink view) or looplinked (looplink view) peptides that mapped to the reported proteins and positions. The total number of identified crosslinked (crosslink view) or looplinked (looplink view) peptides that mapped to the reported proteins and positions. Only peptides that meet the current filtering criteria are counted. Note: The individual peptides may be viewed by clicking a row in the table to view a table of peptides. Rows in that peptide table may also be viewed to view the underlying PSMs and view spectra. See View Peptides. Of the # of peptides, the total number that uniquely mapped to this protein pair (crosslink view) or protein (looplink view). If peptide-level filters are being used, the best score from all peptides matching to the indicated proteins and positions will be displayed for each filter. If PSM-level filters are being used, the best score from all PSMs matching to the indicated proteins and positions will be displayed for each filter. The peptide identificaton as it was reported by the respective search program. The sequences of the two crosslinked peptides. The positions in the respective peptides that were crosslinked (starting at 1). The sequence of the looplinked peptide. The positions in the peptide that were looplinked. A column for each peptide-level score is shown. The number of PSMs that meet the cutoff criteria that identified this peptide. If PSM-level filters are being used, the best score from all PSMs matching to this peptide for each score on which PSMs are being filtered. A column for each PSM-level score or annotation.